The Markets attempted a breakout in the Friday’s session as the Markets opened positive and continued to trade below 10785-mark. However, the second half of the session saw Markets gaining strength and attempted to break out of the consolidation zone it created. It ended a notch above the 10785-mark gaining 89.95 points or 0.84%. As we step into the fresh week, we have political event of Karnataka election results which is likely to effect the Markets and along with this, it will also infuse some volatility in the trade. With various opinion polls predicting a hung assembly in Karnataka, we might see a tepid start to the trade. In any event, with the breakout not yet been confirmed, the levels of 10785 still continues to remain critical levels to watch for. 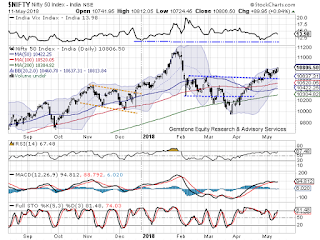 Monday is likely to see 10835 and 10880 acting as immediate resistance area for the Markets. Supports come in at 10750 and 10710 zones. The Relative Strength Index – RSI on the Daily Chart is 67.4812. It shows a bearish divergence as while NIFTY marked a fresh 14-period high, RSI did not do so. Daily MACD stays bullish while trading above it signal line. A white body occurred on Candles and apart from this, no significant formations were observed. Pattern analysis shows that after breaking out of the rectangle formation, the NIFTY suffered a minor throwback after marking high of 10785. After a brief consolidation, the NIFTY has attempted to move past 10785-mark. However, a confirmation to this attempted breakout is awaited. Overall, apart from the political event of Karnataka election results that is likely to infuse volatility in to the Markets, the 10785 continues to remain critical levels to watch for. Unless the 10785-level is breached on the upside, Markets may continue to remain under consolidation. Internal technicals suggest strength and more likelihood of NIFTY inching higher. We continue to recommend making selective purchases with any opportunity that expected volatility might offer. Though cautious, positive outlook is advised for the day. However, until the results come out next week, we might see tentative approach prevailing in the Markets. Good technical set up is observed in stocks like VEDANTA, YES BANK, HINDZINC, CG Power, NATIONAL ALUMIUM, PETRONET, LARSEN & TOUBRO, PETRONET LNG, CAPITAL FIRST and BHARAT FINANCIAL.